1. Intro and n00b Guide 2. First Trailer 3. Developer Interview 4. Second Trailer 5. What Now? 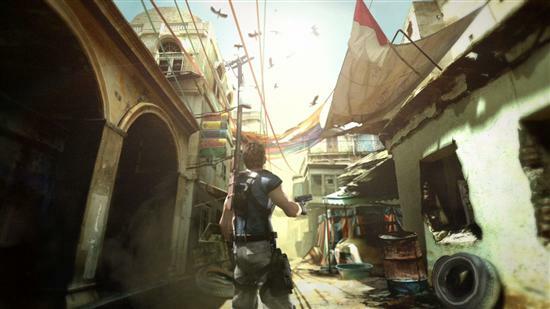 The first glimpse of Resident Evil 5 was at Sony’s 2005 Playstation Meeting in Japan. Although only a minute long and clearly not actual gameplay footage, it did give us a nice tease of the setting for the new game. The trailer starts in near pitch blackness, following closely after someone as they proceed cautiously down an empty street. Suddenly, there is a burst of movement, and the overhead “roof” disperses in a flutter of crows, flooding the street with brilliant sunlight. I see the light! It burns! We are left with a deserted Arabian-style street. This was a bit shocking to fans of past REs simply because it is so rare to see this amount of cheerful sunlight. And yet, they still manage to leave you with the edgy feeling that something isn’t right. Our main character would likely agree as he stands squinting in the harsh light. Here you can see an incredible amount of detail in his face. The effect is great: The haggard look of a hunted man really comes across in the dark patches under the eyes and the rough, unshaven face. 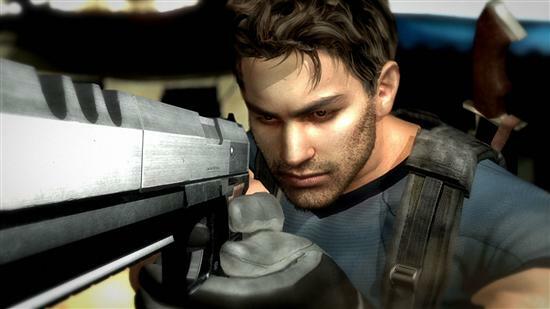 Fans of the series will be pleased to know that it has now been confirmed that he is in fact Chris Redfield, a protagonist from the original Resident Evil game, returned to rid the world of undead once again. You’d look like this too if you had not-zombies chasing you all the time. And then came the zombies. Or are they “not-zombies”? In fact, they are not actually shown here, only their shadows and silhouettes. But you can see that once they realize the main character is around, they start running at a frightening speed towards him; this seems to suggest that the enemies are going to be a lot more agile than they have been in the past games, a scary proposition indeed seeing as the slow enemies in past games were pretty hard to deal with already. Then, the protagonist whips around, draws his hefty looking pistol and… the trailer ends. Damn it! We want to see more!